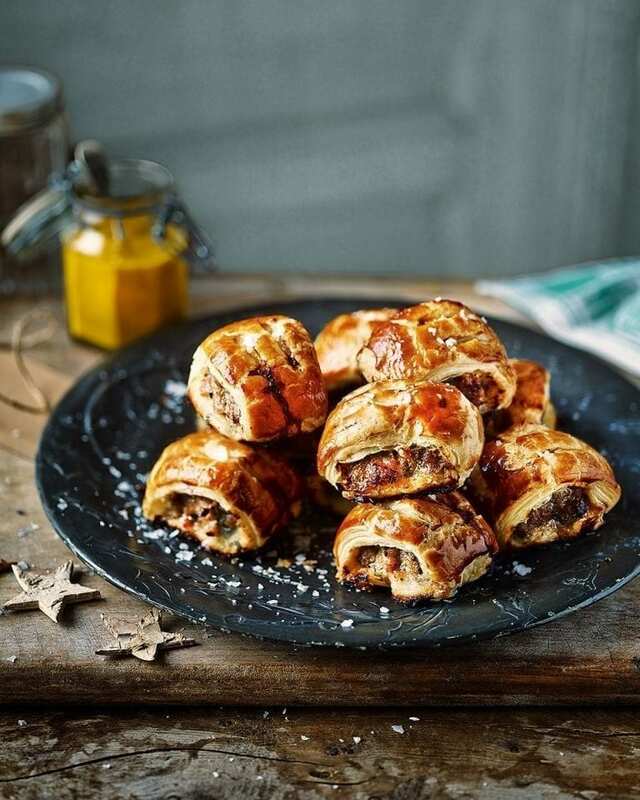 These mustard and tarragon sausage rolls are perfect party nibbles that never fail to impress. Remove the meat from the sausage skins and put into a bowl (discard the skins). Mix in the tarragon and mustards using a fork. Season (see tips) and set aside. Unroll the pastry onto a lightly floured surface, then transfer to a large baking sheet lined with baking paper. Brush the side facing upwards generously with English mustard, then cut in half lengthways. Divide the meat into 2 equal portions, then roll out to make 2 sausages, the length of the pastry. Lay one down the centre of each pastry slice. Working one at a time, fold the pastry over the sausage meat to meet at the top. Pinch the pastry well where the edges meet to seal (see tips), then turn the roll over so the seal sits at the bottom. Preheat the oven to 200°C/fan180°C/gas 6. Brush the top and sides of the pastry with beaten egg yolk. With a sharp knife, cut a series of small diagonal slashes about 1cm apart into the pastry along each roll. Put on lined baking sheets in the fridge for 10 minutes, then remove and brush both rolls again with egg yolk. Bake for 25-30 minutes until puffed, crisp and dark golden all over. Slice into approximate 3cm lengths to serve. The seasoning in sausage meat varies a lot. Heat a little oil in a frying pan and add a small pinch of sausage mix. Fry for 2 minutes, then taste and season. Make sure the edges of your sausage rolls are properly sealed in step 3 so the juices are locked in. You can assemble the sausage rolls in the morning, then keep them in the fridge to cook later in the day. They freeze well, too. Freeze uncooked on a baking sheet until solid. Wrap in cling film and foil, then store for up to 2 months. Cook from frozen until hot and golden brown – add 5-10 minutes to the oven time. The best sausage rolls ever. They couldn’t be easier and they make a perfect snack for when friends are over. Can’t wait to make these again!